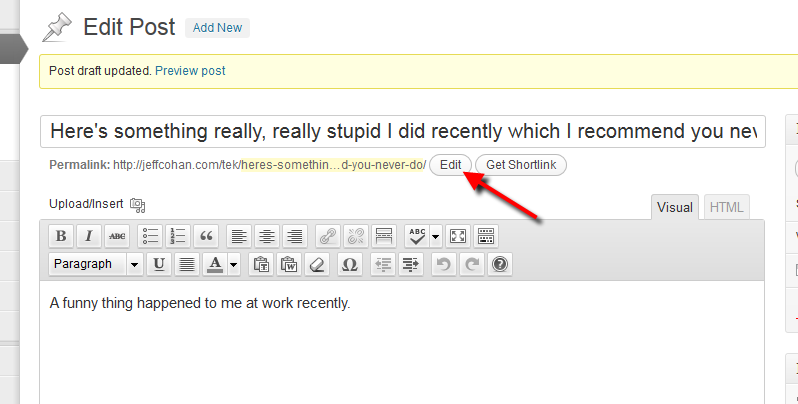 Note: This article assumes you have configured your WordPress Permalink settings to include the post name. If your permalinks use the default setting, then (a) this tip doesn’t apply and (b) you really ought to change your permalink settings to include the post name! When posting a blog article or page to your WordPress Web site, WordPress will automatically generate a "sanitized" slug which is the defining element of the post in its URL. 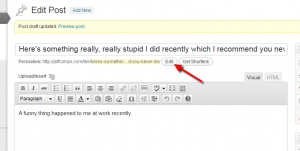 Unless you manually edit that slug (which can be done in two ways, described below), the default slug will be the title of your post, with all letters changed to lowercase and all spaces and other special characters (commas, slashes, etc.) converted to hyphens or removed. So, suppose you’re publishing a blog article about the lesson your learned about putting your online banking username and password on a sticky note attached to your computer monitor at work. You might get creative and entitle your post, "Here’s something really, really stupid I did recently which I recommend you never do" Not a bad title, actually. If I saw title that in my newsreader (or Facebook newsfeed or Twitter timeline, etc. ), I might be inclined to click and read. Broken Link Syndrome: That URL is so long that if you were to email it to a friend, there’s a chance your friend’s email program would break the link, preventing your friend from getting to the article. No key words: A Web page’s URL is one of it’s critical search engine optimization elements. Note: In each of the methods described below, the new slug you enter will be sanitized (letters lowercased, spaces replaced with hyphens, special characters removed) after you do the Update. 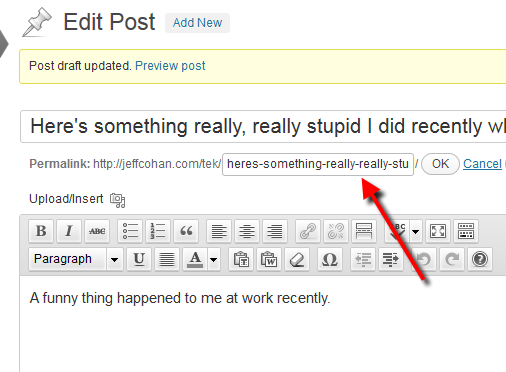 If your screen options for Edit Post are set to display the slug section, find it somewhere on the screen and enter the new slug. 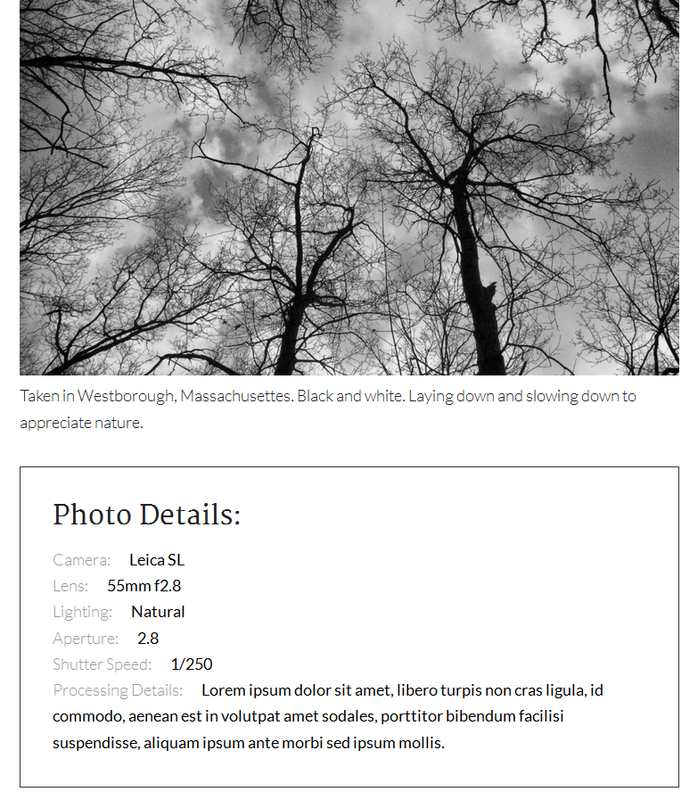 Hover your mouse over the title of the post whose slug you want to change, and a little menu will appear under the title. 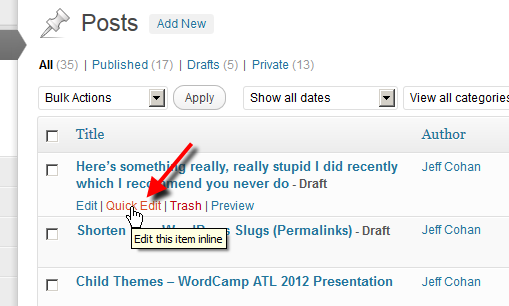 Click on "Quick Edit" link. 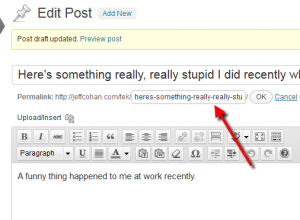 Can I and should I go back and change some of my longer post slugs after the pages or posts have been published? If you emailed the original link to people, or posted it on Facebook — or anywhere else, for that matter — people who click on the original link will end up on your site’s Not Found page. This also applies if the original link of the page in question has been listed by search engines. Losing some search engine mojo. 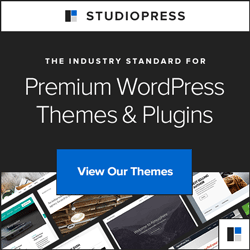 How to embed a YouTube Video in WordPress Display WordPress and WooCommerce Tags as Lists NextGen Gallery Compact Album Mods How to use Advanced Custom Fields with Genesis What are WordPress Post Formats, and why should I care? 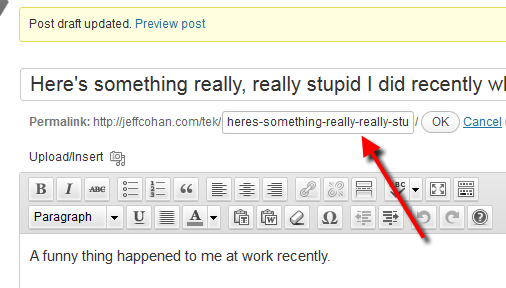 Helpful post, Jeff. Thank you! I especially appreciated your comments about whether or not to go back and change a slug after a post has been published. Glad you found it helpful, Chad. Well done for this helpful article. Can you please suggest me the perfect slug of the title. I mean to say that what should be there in slug section ? 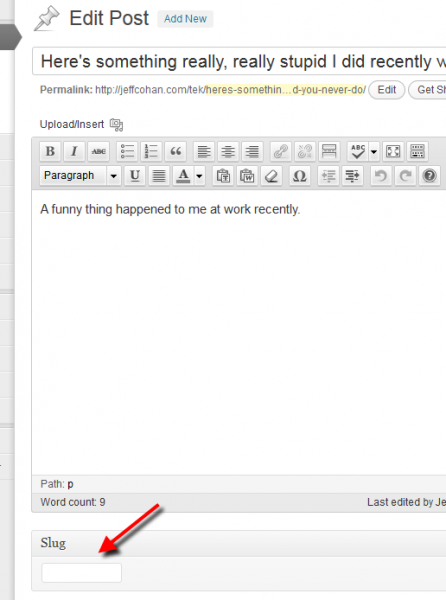 Can we replace default slug by keywords ? Can we remove few words from default slug for this ? So, please help me !!! waiting for your suggestion Admin. I like to keep slugs short. 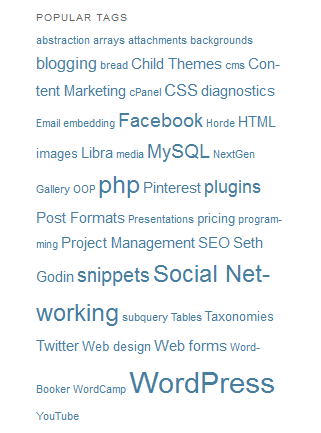 I like them to include keywords. I almost always edit the default slugs and remove unnecesary words. For this particular blog entry, for example, I removed the word “your”, which appears in the title but which isn’t needed in the slug (IMO). I got my answer & its working good.. Very helpful Jeff, thank you. I try to make simple and easy to understand post so I am happy to see someone do a much better job. I hope to start adding screen shots too, it only get’s better. Had query about this slug shortening which has always been pointed up by my SEO analysis page. But got my query resolved after seeing your this post. Thank you so much! Thanks so much, great info on slug role. Always wondered what it was useful for *smile*. Nice easy, well written explanation Jeff.